^ 1.0 1.1 1.2 Kermeli, Eugenia. Osman I. (编) Ágoston, Gábor; Bruce Masters. Encyclopedia of the Ottoman Empire. 2009: 444. Reliable information regarding Osman is scarce. His birth date is unknown and his symbolic significance as the father of the dynasty has encouraged the development of mythic tales regarding the ruler’s life and origins, however, historians agree that before 1300, Osman was simply one among a number of Turkoman tribal leaders operating in the Sakarya region. ^ Heath W. Lowry. The Nature of the Early Ottoman State. Albany: SUNY Press. 2003: 153. ISBN 978-0-7914-8726-6. ^ Kafadar, Cemal. Between Two Worlds: The Construction of the Ottoman State. 1995: xii. There is still not one authentic written document known from the time of ʿOsmān, and there are not many from the fourteenth century altogether. ^ Kafadar, Cemal. Between Two Worlds: The Construction of the Ottoman State. 1995: 93. ^ Imber, Colin. Elizabeth Zachariadou, 编. The Ottoman Emirate (1300-1389). Rethymnon: Crete University Press. 1991: 75. Almost all the traditional tales about Osman Gazi are fictitious. The best thing a modern historian can do is to admit frankly that the earliest history of the Ottomans is a black hole. Any attempt to fill this hole will result simply in more fables. ^ 9.0 9.1 Kafadar, Cemal. Between Two Worlds: The Construction of the Ottoman State. 1995: 122. That they hailed from the Kayı branch of the Oğuz confederacy seems to be a creative "rediscovery" in the genealogical concoction of the fifteenth century. It is missing not only in Ahmedi but also, and more importantly, in the Yahşi Fakih-Aşıkpaşazade narrative, which gives its own version of an elaborate genealogical family tree going back to Noah. If there was a particularly significant claim to Kayı lineage, it is hard to imagine that Yahşi Fakih would not have heard of it. ^ Kafadar, Cemal. Between Two Worlds: The Construction of the Ottoman State. 1995: 124. ^ Finkel, Caroline. Osman's Dream: The Story of the Ottoman Empire, 1300-1923. Basic Books. 2005: 12. Beyond the likelihood that the first Ottoman sultan was a historical figure, a Turcoman Muslim marcher-lord of the Byzantine frontier in north-west Anatolia whose father may have been called Ertuğrul, there is little other biographical information about Osman. ^ Murphey, Rhoads. Exploring Ottoman Sovereignty: Tradition, Image, and Practice in the Ottoman Imperial Household, 1400-1800. London: Continuum. 2008: 24. ISBN 978-1-84725-220-3. ^ Imber, Colin. The Ottoman Empire, 1300-1650: The Structure of Power 2. New York: Palgrave Macmillan. 2009: 8. Kafadar, Cemal. Between Two Worlds: The Construction of the Ottoman State. 1995: 129. Of [military undertakings] we know nothing with certainty until the Battle of Bapheus, Osman's triumphant confrontation with a Byzantine force in 1301 (or 1302), which is the first datable incident in his life. ^ Kermeli, Eugenia. Osman I. (编) Ágoston, Gábor; Bruce Masters. Encyclopedia of the Ottoman Empire. 2009: 445. Apart from these chronicles, there are later sources that begin to establish Osman as a mythic figure. From the 16th century onward a number of dynastic myths are used by Ottoman and Western authors, endowing the founder of the dynasty with more exalted origins. Among these is recounted the famous “dream of Osman” which is supposed to have taken place while he was a guest in the house of a sheikh, Edebali. [...] This highly symbolic narrative should be understood, however, as an example of eschatological mythology required by the subsequent success of the Ottoman emirate to surround the founder of the dynasty with supernatural vision, providential success, and an illustrious genealogy. Imber, Colin. The Ottoman Dynastic Myth. Turcica. 1987, 19: 7–27. The attraction of Aşıkpasazade's story was not only that it furnished an episode proving that God had bestowed rulership on the Ottomans, but also that it provided, side by side with the physical descent from Oguz Khan, a spiritual descent. [...] Hence the physical union of Osman with a saint's daughter gave the dynasty a spiritual legitimacy and became, after the 1480s, an integral feature of dynastic mythology. ^ Finkel, Caroline. Osman's Dream: The Story of the Ottoman Empire, 1300-1923. Basic Books. 2005: 2. , citing Lindner, Rudi P. Nomads and Ottomans in Medieval Anatolia. Bloomington: Indiana University Press. 1983: 37. ISBN 0-933070-12-8. ^ Finkel, Caroline. Osman's Dream: The Story of the Ottoman Empire, 1300-1923. Basic Books. : 2. ISBN 978-0-465-02396-7. First communicated in this form in the later fifteenth century, a century and a half after Osman's death in about 1323, this dream became one of the most resilient founding myths of the empire. ^ Kafadar, Cemal. Between Two Worlds: The Construction of the Ottoman State. 1995: 132–3. ^ Girding on the Sword of Osman (PDF). The New York Times. 1876-09-18: 2 [2009-04-19]. ISSN 0362-4331. ^ Kafadar, Cemal. Between Two Worlds: The Construction of the Ottoman State. 1995: 10, 37. ^ Kafadar, Cemal. Between Two Worlds: The Construction of the Ottoman State. 1995: 105. ^ Kafadar, Cemal. Between Two Worlds: The Construction of the Ottoman State. 1995: 107–8. ^ Duducu, Jem. The Sultans: The Rise and Fall of the Ottoman Rulers and Their World: A 600-Year History. Amberley Publishing. 2018-01-15. ISBN 9781445668611 （英语）. ^ Lowry, Heath. The Nature of the Early Ottoman State. SUNY Press. 2003: 153. ^ 32.0 32.1 32.2 32.3 32.4 Lowry, Heath. The Nature of the Early Ottoman State. SUNY Press. 2003: 73. Finkel, Caroline. Osman's Dream: The Story of the Ottoman Empire, 1300-1923. New York: Basic Books. 2005. ISBN 978-0-465-02396-7. Fleet, Kate. The rise of the Ottomans. (编) Maribel Fierro. The New Cambridge History of Islam 2. Cambridge: Cambridge University Press. 2010: 313–331. ISBN 978-0-521-83957-0. Imber, Colin. The Ottoman Dynastic Myth. Turcica. 1987, 19: 7–27. Imber, Colin. The Ottoman Empire, 1300-1650: The Structure of Power 2. New York: Palgrave Macmillan. 2009. ISBN 978-0-230-57451-9. Kermeli, Eugenia. 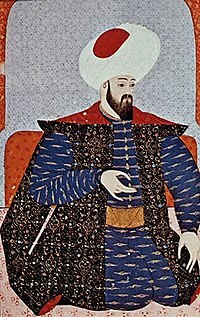 Osman I. (编) Ágoston, Gábor; Bruce Masters. Encyclopedia of the Ottoman Empire. New York: Facts on File. 2009: 444–6. ISBN 978-0-8160-6259-1. Lowry, Heath. The Nature of the Early Ottoman State. Albany: SUNY Press. 2003. ISBN 0-7914-5636-6. Murphey, Rhoads. Exploring Ottoman Sovereignty: Tradition, Image, and Practice in the Ottoman Imperial Household, 1400-1800. London: Continuum. 2008. ISBN 978-1-84725-220-3. Zachariadou, Elizabeth (编). The Ottoman Emirate (1300-1389). Rethymnon: Crete University Press. 1991.